We are going to start the Triodion with the Sunday of the Pharisee and the Tax- collector and so I have chosen a passage from a sermon by St Basil the Great based on a sentence, which occurs a number of times in the Bible. It means something like 'Be careful/', 'Take care! ', but because St Basil underlines the importance of worrying about ourselves, not other people, I have translated it 'Look to yourself', which is the literal meaning of the Greek. 'Look to yourself', says Scripture, by not attending to what is unreal, but concentrating on what is useful here and now. meddle in other people's affairs rather than to look closely into our own, so that we may avoid this, Scripture tells us to stop busying ourselves about someone else's wrongdoings. Don't occupy yourself with thoughts of how to scrutinise someone else's weakness, but look to yourself, that is turn the eye of your soul to the examination of your own. For many people, in our Lord's words, notice the splinter in their brother's eye, but don't see the beam in their own. So don't stop examining yourself to see if your way of life is progressing in accordance with God's command, but not looking around to see if you can discover something to find fault with in another, like that overbearing and boastful Pharisee, who stood justifying himself and disparaging the Tax-collector. But do not stop judging yourself. Have I sinned in any way in my ideas? Has my tongue slipped up by running ahead of my intention? In the works of your hands has anything involuntary been done? And even if you find many sins in your way of life (as a human being you will always find them), say the words of the tax-collector, 'God, be merciful to me, a sinner'. This word is for you, and if ever you are radiantly happy and your life is being carried along with the flow, it will stand by you like a good counsellor, reminding you of human things. And if you are hard pressed by circumstances, may your heart be enchanted by it, so that you are neither elevated by vanity to excessive boasting, nor fall through despair to gloomy despondency. Do you pride yourself on your wealth? Do you give yourself airs because of your ancestors? Are you conceited about your country, the beauty of your body and your honours from everyone? Look to yourself, because you are mortal, because you are earth and will return to earth. Look around at those who before you experienced similar celebrity. Where are those who were robed in political power? Where are those unbeatable rhetoricians? Where those who paid for festivals? Where the famous owners of thoroughbred horses? Where the generals, the governors, the tyrants? Isn't it all dust? Isn't it all a myth? Don't the memorials of their life consist of a few bones? Lean down into the tombs and see if you can decide who the servant is, who the master, who the beggar and who the wealthy. Sort out, if you can, the prisoner from the king, the strong from the weak, the handsome from the ugly. If you remember your nature you will never be puffed up. If you remember yourself, you will look to yourself. On the other hand, are you low-born and undistinguished, poorest of the poor, homeless, cityless, weak, lacking daily necessities, trembling at the authorities, cowering before everyone because of your retched way of life? For the poor, says Scripture, endures no threat. So don't despair of yourself, nor, because you have nothing worth envying in this present life, throwaway every good hope; but raise your soul to the good things that are already yours from God and to those that will come to later through his promise. First of all, you are a human being, alone of living creatures fashioned by God. Isn't this sufficient, for someone who reckons soberly, for the highest bliss, that they were fashioned by the very hands of the God who keeps all things in existence? Next, that being made in the image of the Creator, you can speedily attain equal honour with the angels by leading a good life? You have received a rational soul, through which you can think about God, by thought observe the nature of beings, pluck the sweetest fruit of wisdom. All land animals, both tame and wild, all those that dwell in the waters and all that fly through the air are your servants and your subjects. Haven't you discovered skills, established cities and all thought up that is necessary and all that gives pleasure? Aren't the oceans accessible to you through reason? Don't land and sea serve your way of life? Don't air and sky and the dances of the stars reveal their order to you? Why then are you wretched because you don't own a horse with a silver bridle? You've got the sun, which in its swift course provides you with a lamp throughout the day. You may not have lights of silver and gold, but you have the moon which floods you with its own unlimited light. You haven't mounted chariots inlaid with gold, but you've got feet as your own transport and is native to yourself. Why do you call happy those who possess well-stuffed purses, but need others' feet to move about? You may not sleep on an ivory bed, but you have the earth, which is far more precious than ivory, and the rest you have on it is sweet and sleep comes quickly and drives out care. You may not lie under a golden ceiling, but you have the sky, which gleams with the ineffable beauties of the stars. All these are human things; but there are still better. For your sake there is God among men, sharing out of the holy Spirit, abolition of death, hope of resurrection, divine commands that perfect your life, a way to God through the commandments, a glorious heavenly kingdom, crowns of justice are ready for anyone who does not run away from toiling for virtue. Introduction and translation of text by permission of copyright © of the Very Rev. 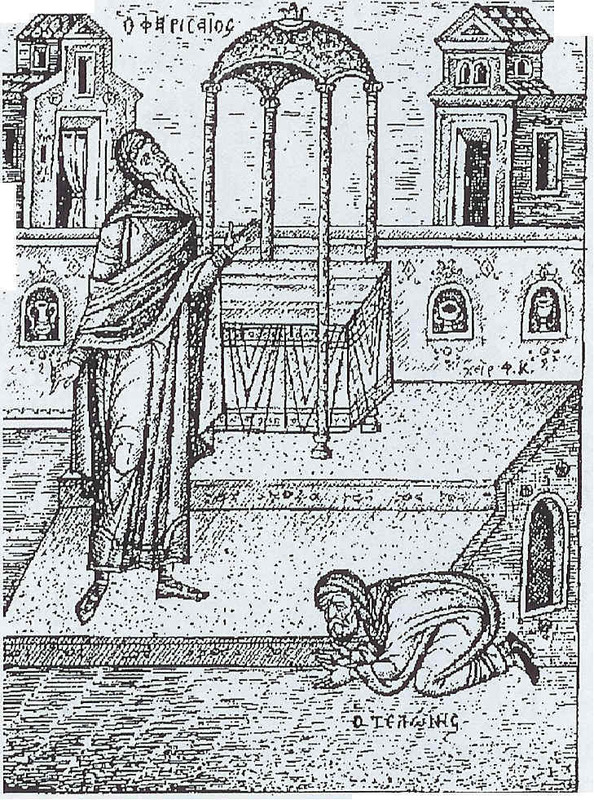 Archimandrite of the Oecumenical Throne Ephrem Lash. Also appeared originally in Light of Christ, Newsletter of the Orthodox Church of St. John the Baptist and St. Anthony, London, February 2005, Num 43. Presentation: ORTHODOX CHRISTIAN COMMENT, February 2005.